With just about any movie based on a book I tend to avoid the book until after I’ve seen the movie, just for the sake of saving myself from spoilers, or keeping my viewing experience fresh and without expectation. Having either never read Macbeth (yes even while in school), or read it and completely forgotten everything about it before seeing the film (I can’t be sure which), I was prepared to watch this film entirely without knowledge or expectation about it. Yet being a film based on a Shakespeare, most viewers are likely to at least vaguely recall this piece of high school required reading. It takes strong performances and strong direction to sell Shakespeare's words today, and everyone involved are up to the task here. I could say that the Shakespearian dialogue wasn’t detrimental enough to keep me from following this film, but I know the mere fact that it is in Shakespeare’s words will be enough to turn off some viewers, especially those who aren't Shakespeare buffs. But as a word of warning, even if you don’t have difficulty translating the dialogue, you may have difficulty hearing everything. As strong as the performances are, lines are often said in a moody mumble. No matter how familiar you are with Shakespeare's work, you’re still likely to want subtitles for this one. 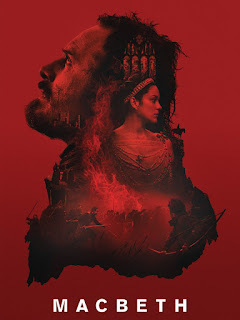 Nevertheless Shakespeare’s tale of murder, guilt and paranoia is beautifully rendered by director Justin Kurzel, whose visuals make this film more than it otherwise would have been. It successfully sticks to the heart of story, even if it spends more time accentuating the visuals than delving into the guilt and paranoia that drives Shakespeare’s “Macbeth.” It isn’t as though those things aren’t present, they are essential to driving the story forward, but they feel like smaller elements than perhaps they should. The soundtrack, cinematography, editing, and performances are all highlights. They're so stunningly gorgeous that they easily rank among the best to come out of 2015. The violence is brutal, the drama is well acted, and the music continually swells at just the right moments. The cinematography captures the beautiful set pieces in inspired ways, and the editing takes a unique approach to battle scenes. The opening battle sequence is a particularly astounding mixture of beautiful cinematography and a unique editing style. It moves its way through slow motion shots of visceral fighting framed in such a way that they resemble old paintings of war you'd expect to see in a museum. It's a novel approach to the cinematic battle sequence that feels like a visual style appropriate to the era it's capturing. After this opening battle, in which Macbeth (Michael Fassbender) leads the army of Scottish King Duncan to victory, three witches appear to Macbeth giving a prophecy that he is to be King of Scotland. Upon returning to his home, his wife (Marion Cotillard) urges him to fulfill the prophecy by taking the crown for himself. After much temptation, he murders King Duncan while he sleeps, and accepts the crown the following morning. However, there are those close to Macbeth and the former King that have their suspicions as to who murdered Duncan. Chief among them is Macbeth's close friend Banquo (Paddy Considine), who knows of the prophecy that was told to Macbeth. The suspicions don't go unnoticed by Macbeth who adds paranoia to his guilt. They create within him a tyrannical ruler who kills not just anyone he suspects of knowledge of his treachery, but their entire families. As his dark deeds grow in number, even his previously evil spirited wife can't bare his actions. Many flee to England where a force begins to rise against Macbeth. Witches, haunting images of those he killed to get where he is, guilt and paranoia remain the primary elements at play in "Macbeth." As such, Michael Fassbender makes an inspired choice to play the title character, having made a career out of playing tortured, tormented souls in films such as "Shame" and "Hunger." Marion Cotillard is one of the best actresses working today, and she gives a strong performance with multiple layers. First she is the steely eyed temptress intensely driven by blind ambition. Later she's turned into a remorseful watcher, terrified by the monster she created, and tormented by her inability to take back what's been done. She knows all too well that the lives of the innocent are as much on her hands as they are Macbeth's. If it feels like my description is a vastly simplified version of the events in this story, the film does very little to expand upon them. Sure there are details I left out for those that didn't want a plot by plot breakdown before seeing the movie for themselves, but at just under two hours, the film feels a bit like the CliffsNotes version. Though I will say a number of the famous quotable speeches are present and performed beautifully, even if a few of them are done in an understated way. Kurzel accentuates the sound and the fury of "Macbeth" with visceral action, striking visuals and a particularly effective score by Justin Kurzel's brother Jed Kurzel. It's effectively moody and often quite eery. How this film managed to fly so under the radar (to my knowledge it was never given a proper wide theatrical release) is beyond me. It's one of the most visually striking films I've seen in quite some time. Whether Kurzel's visual style overwhelms the story is a question of taste, but count me among the viewers that have responded favorably. Kurzel and Fassbender are set to re-team for the "Assassin's Creed" adaptation scheduled to release in December of this year. As a fan of the game series, I now anxiously await the film knowing who's behind it.